Contact us with any questions you may have, and we'll do our best to answer them. Visitors can expect a reply within the day. We typically answer messages during our normal office hours from 8 a.m. to 4 p.m. If you have a specific question for another business in town, you can also send a message through the contact form located on their profile page on Visit St. Augustine. Connect St. Augustine's citizens, organizations, businesses, and visitors	together with information to enhance everyone's understanding of this vibrant, historic city. 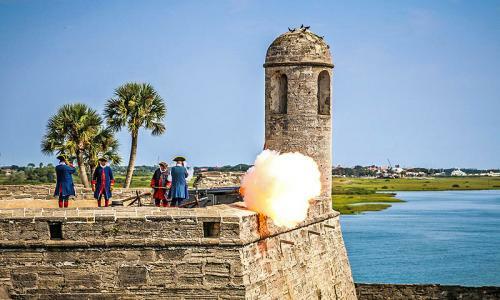 VisitStAugustine.com is an online visitor's guide for the nation's oldest city. Unlike printed booklets, the boundless space of the internet allows us to profile ALL the restaurants, attractions, places to stay, and tour services in St. Augustine. We update content on the website continuously, and strive to give our visitors the most accurate and up-to-date information possible. We hope you enjoy browsing VisitStAugustine.com and have a wonderful time when you visit our beautiful city! VisitStAugustine.com was conceived by Henry Hird in 1998. Like most projects Henry	works on, this one took quite a while to be realized. With a lot of technical and design help,	the site was officially launched in the spring of 2008. In addition to our current staff, the following people were instrumental in this project: Luke Allman, Emily Dozier, Kate Groeneveld, Dan Hird, Edward Hird, Amy Howard, Melissa Lichtenberger, Bill Loughlin, Mark Mahon, Jennie Newton, Rick Parola, Cassandra Pleasent, Alexandra Pooler, Dave Przekwas, Ryan Ropero, Quentin Simpson, Bonnie Stanley, Sarah Worthington, and Dave Wright.